Based on the GM part number on the tag and bell housing, it is out of a GEO Tracker or Suzuki Sidekick. Should be TH180 or 3L30. The 4L30-E replaced the Th180/3L30 in the 90’s. Other than a slight increase in idle, decrease in fuel mileage and an odor, no you will not notice it in regen. Build date it is a 15, a 15.5 has RPO code AVF in the glove box. Uncertain if you have a 2015 or 2015.5, there is a difference how the reverse lights work. for 2015, press the cargo light switch and the reverse lights will come on in park and neutral only. for 2015.5, press the cargo light switch and the reverse lights will come on in park,, neutral and reverse. For the front facing markers, they should come on when running lights are on. Since they aren’t power fold, they could be the accessory or aftermarket mirror and door harnesses might not have been changed at the same time. Showed up in the trucks in 2016 and not all 2016’s got it due to shortage in radios. Description says no drill. Typing the part number online, instructions come up and they are held on with double sided tape. - If you just want door sill plates, Putco offers them for the K2 trucks. '84 K20 starter cracked, needs starter brace? Seen them on many small and big block GM. Have a few of each in the spare parts pile. Yes Chevy small blocks and big blocks from the 60’s to 90’s used a bracket that attached to the end of the starter to the block. Big block - https://www.summitracing.com/parts/nal-03965588?seid=srese1&cm_mmc=pla-google-_-shopping-_-srese1-_-chevrolet-performance&gclid=EAIaIQobChMIo-ymoYm64QIVFIzICh3P-AOXEAQYBCABEgI97fD_BwE Small block - https://www.summitracing.com/parts/nal-03965589?seid=srese1&cm_mmc=pla-google-_-shopping-_-srese1-_-chevrolet-performance&gclid=EAIaIQobChMI-_fg3Yi64QIVGbbICh3sFQwuEAQYASABEgKGiPD_BwE These are samples, not saying correct for your setup. Yes, K2 1500’s are 2014-2019 and K2 HDs are 2015-2019. T1 platforms is also 2019 1500 trucks. Tow mirror upgrade and issue! GM did not offer a factory power fold camper style tow mirror on the GMT900 trucks. This style mirror came out starting with the 2015.5 model year. The mounting bases are different between the GMT900 and K2 trucks, so in order to mount the K2 mirrors, the bases will need to be modified. Other option would be to go aftermarket, but they are still manual fold. Head over to duramxforum.com, more activity than dieselplace.com. 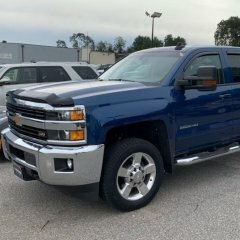 Based on this - https://gm.oemdtc.com/6957/special-coverage-diesel-emission-fluid-tank-reservoir-2013-2015-chevrolet-gmc. 2013’s are covered. Coverage is 10 years or 120,000 miles. my 2015 was replaced beginning of December around 60,000 miles. Jump over to Duramaxforum.com and it is pretty common failure. Depending on on where you live, the DEF system accidentally failing off might not be an option for you due to emissions. Bracket at the DEF tank is shorter, only difference. if you are tuned and deleted, then gas version bolts right up.